With some time left, Ella decided to show us another roll. She had prepared the ingredients for this roll just in case we have time to do it. She is so well organized. 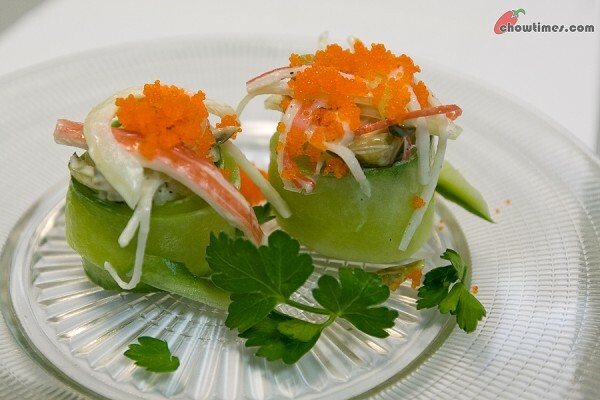 The Cucumber Roll is a great hit especially to people who has not tried sushi before. The flavour of seaweed is too strong for some of the attendees who has never eaten sushi before. 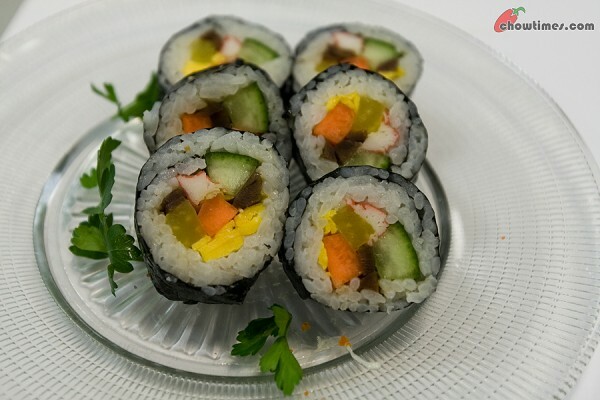 This Cucumber Roll uses thin slices of cucumber to roll up the rice. They are so pretty and delicate. 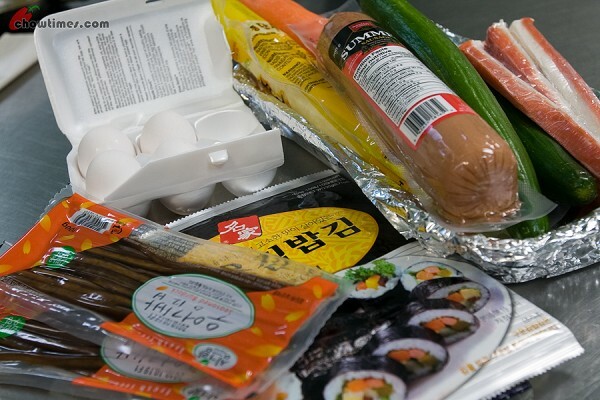 Ella also made some Korean Style Miso Soup in the Gilmore Park Community Kitchen. 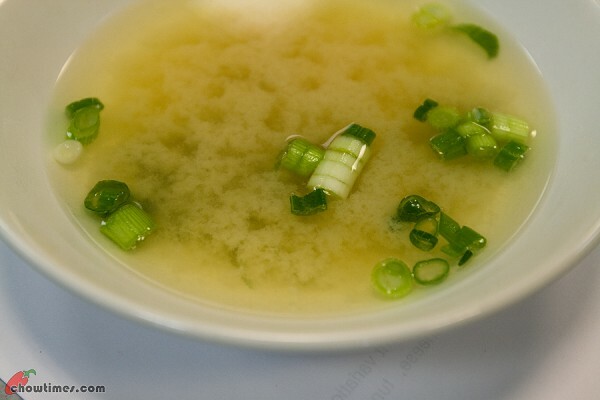 Miso soup is a Japanese culinary staple. 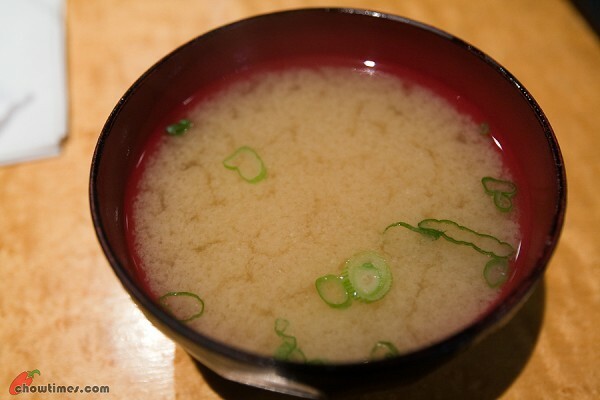 Miso is high in protein and rich in vitamins and minerals. 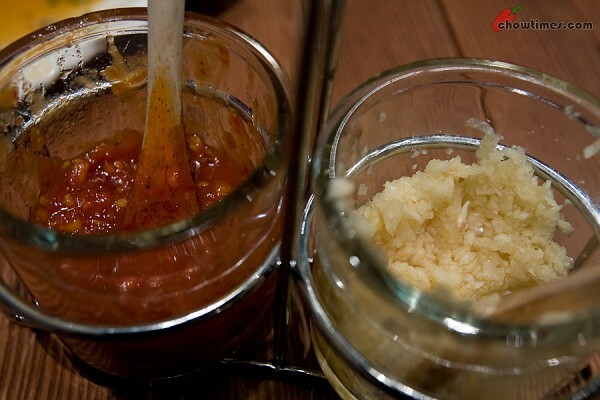 Generally, miso is salty but there are varieties of miso that are sweet, earthy, fruity and savory. What a week for Canada! After two weeks of sports, I am getting a bit fatigued from being glued to the sports event day after day. I am just glad that it is coming to an end — and to a high note too! We all woke up this morning having topped the Gold medal standing for the first time. If all expectations goes according to plan, we will even stretch the Gold medal lead. Which leads me to think that Canada should abandon the American way of determining the medal leaderboard by taking into account the number of medals won. We should follow the rest of the world is ranking it by medal types. Whatever it is, we are at the verge of attaining the most Gold won in BOTH summer and winter Olympics. Ryan made a great suggestion. He asked the chowtimes has a Google Map of all the restaurants we had visited before. This idea was first done by Matt on VancouverSlop which was adopted by CBC’s website (Matt is a genius in these sort of things!). So here is our implementation of our idea. 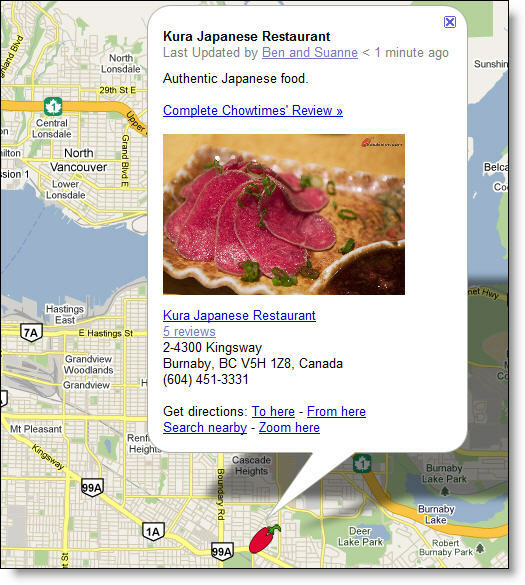 You can get to the Chowtimes Restaurant Explorer by clicking on the Restaurant Explorer link at the top of the page. I made that link with a RED background for now just to show you guys it’s there. The page is still under construction — and it will be while before we retroactively populate all our old restaurant visits. There is, after all, over 400 Metro Vancouver restaurants to go through. Don’t hold your breath! The other features are standard Google Map functionality which we have little to no control over … like “Get directions”. This interface of this embedded Google Map does not behave exactly like if you got to http://maps.google.com … so this is a bit more clunkier and sadly harder to navigate. 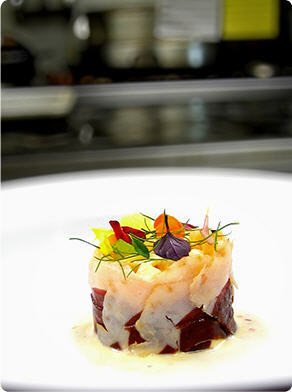 But please have a look at the Restaurant Explorer and let me know what you think. ANY feedback is very much appreciated. We just want to build something that is of use to you readers. Thanks a lot to Ryan for this suggestion. [Sorry Ryan, we still have not found a way to make this fit a 1024 x 768 screen — which we know represents a sizeable 17% of our visitors]. Chowtimes Mentioned on Jennifer 8 Lee’s Blog! OK. it was just a little mention on Jennifer 8 Lee’s blog … a small mention, no link juice for chowtimes.com but still it is a big deal to Suanne and I.
Jennifer 8 Lee is who we want to be when we grow up — not that we will want to at this time. Fancy being invited to speak on a TED conference one day where Suanne speaks on her Underground Restaurant venture. That would be a day right, Suanne? LOL! 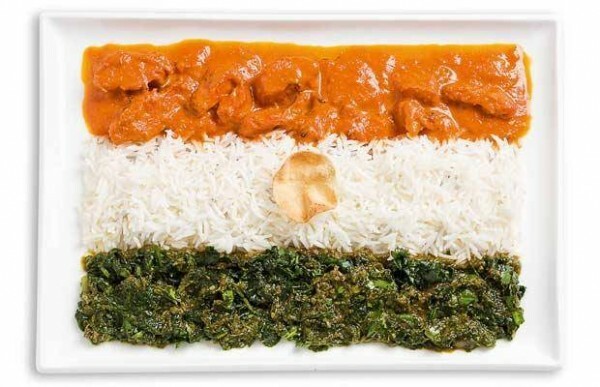 To close off this week’s musings, here is a series of national food made in the image of its respective national flags. It is from a chain email we received from Minoo which we find very interesting. Look over this and let me know if you agree that the food is a fair representation of the food you normally find in the country. 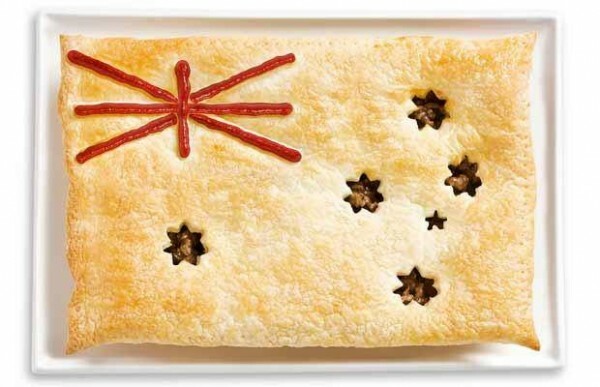 From Australia, the Australian Meat Pie which is a favourite and common take away snack. Brazil. OK we see lime and maybe banana leaf at the background. What is the diamond shape part made of? Pineapple? This one we stumped us. 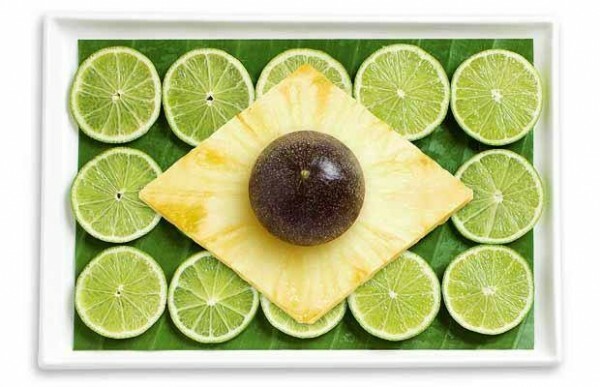 That shows how little we know about Brazil (or for that matter South American) food. The only thing I can think of at the mention of Brazilian food is beef …. mmmm … churrasco! I am sure Brazilian Cuisine is way more than that. China. This is kind of odd. Firstly the Star Fruit. We did not realize that the star fruit is native to China (not that we know where it is from). 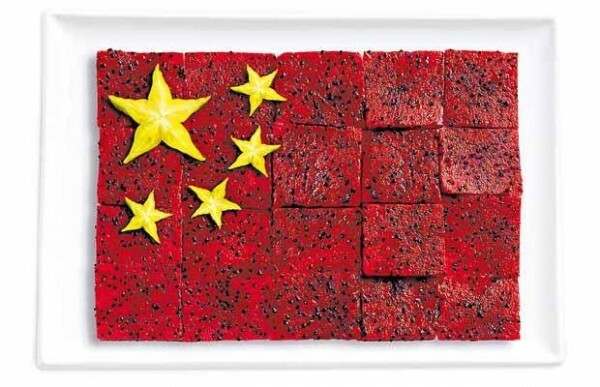 Then the background … it seems like Bak Kwa (Suanne’s recipe here) but we thought it is more South East Asian than it is China. Any one can help? Viva la Francai! 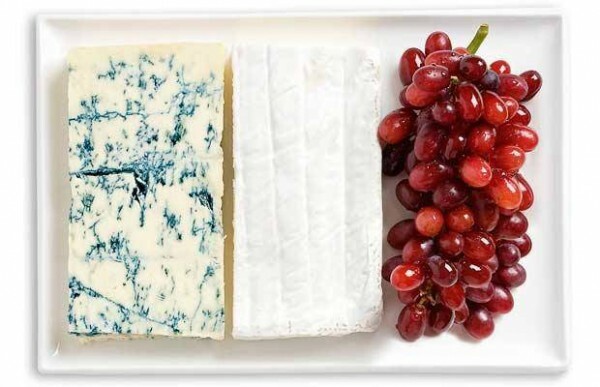 The French flag is represented by Blue Cheese, Brie (which is also the name of a French province) and grapes. 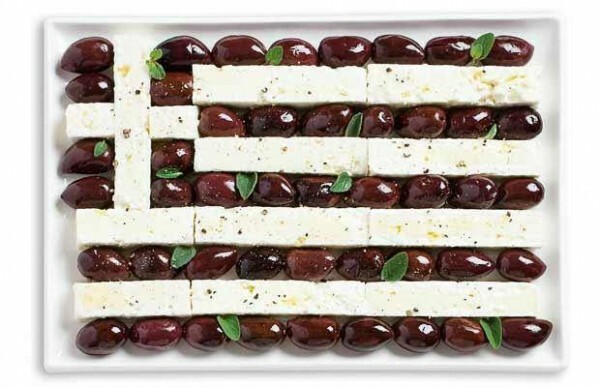 Greece, the cradle of Western Civilization … home of the Olives and Feta Cheese. Updated: 16th Nov 2014; This restaurant is closed according to Urbanspoon.com. There are so many Vancouver food bloggers these days that I could not even catch up reading all of them, let alone aware of all the new ones. However, there was one that caught my attention because he blogs about restaurants in Burnaby and a number of them along Kingsway. So, I had been following Karl of The Friday Lunch for sometime. I like his easy to follow style with short to the point sentences. Not to mention too his selection of restaurants are exactly the type I normally go to. Since both of us work around the vicinity, we arranged to meet up for lunch and say hi. I suggest that we meet at Kura Sushi on Kingway. Kura Sushi had been a place that I wanted to visit for a long time because LotusRapper had recommended that place a few times. I had been trying to save this place up to go with Suanne but we never got round to that — and I think we will never get round to it given all the “To Try” places we have on the list. 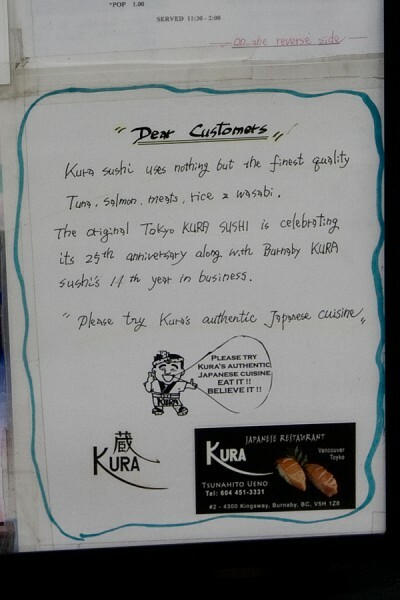 I had walked past Kura Sushi many time before and had seen their menu. 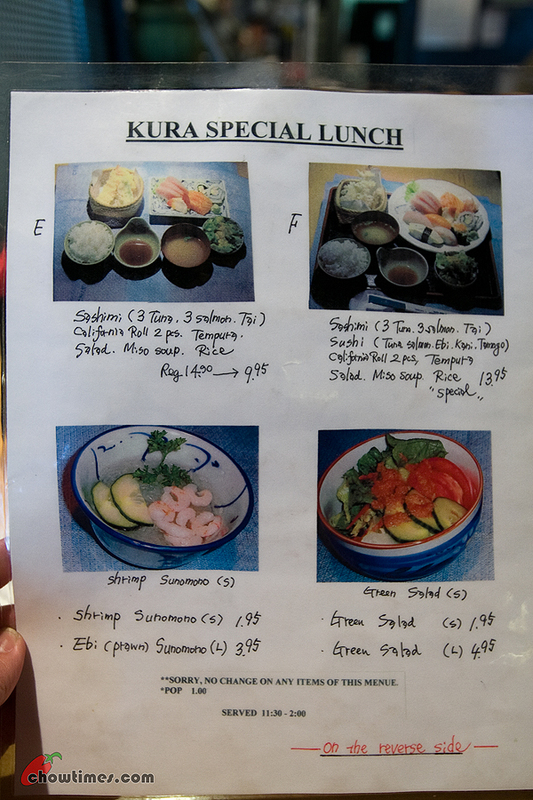 It does give me the impression that this is a very authentic Japanese restaurant (with higher than normal prices). This is reinforced by the heavy wooden door outside. This was a real thick heavy door, not a fake. Frankly I don’t know if this door works in their favour because it sort of felt less welcoming to the customer. That is just my opinion. The hand-written sign outside the restaurant sounded very convincing that they are the only branch of a some big time sushi restaurant in Tokyo. I was curious right? So, I tried googling various combination of Kura-Tokyo-Sushi but came up with some Kura Sushi which is a Kaiten Sushi joint. 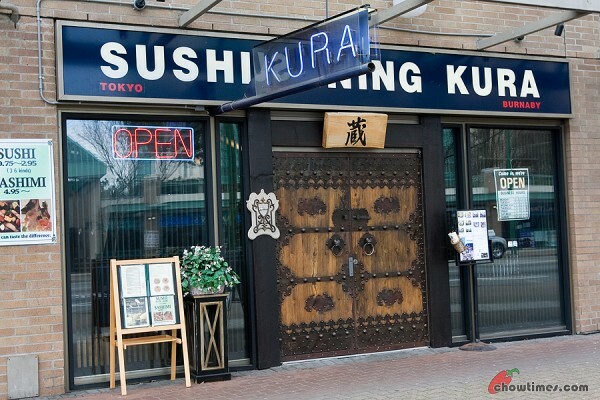 Anyone able to tell me if there is actually a well known Kura Sushi in Tokyo? He he he … at a glance, the picture above looked like it’s some call center operation, right? 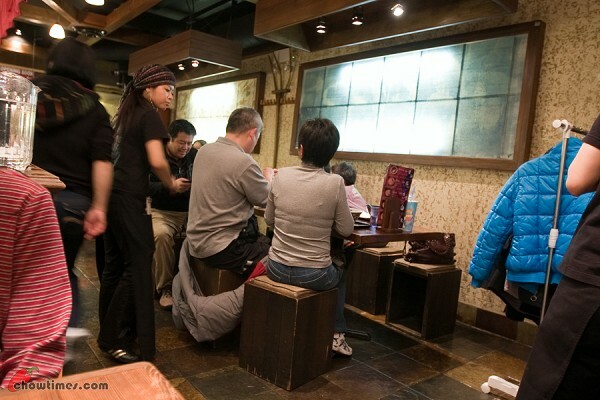 It’s just that they have partitions between the smaller tables just to save space and provide some privacy. From the looks of it, there are a lot of office workers when we were there. I like that tall ceiling and dark walls … and yet it was very well lighted where it matters. 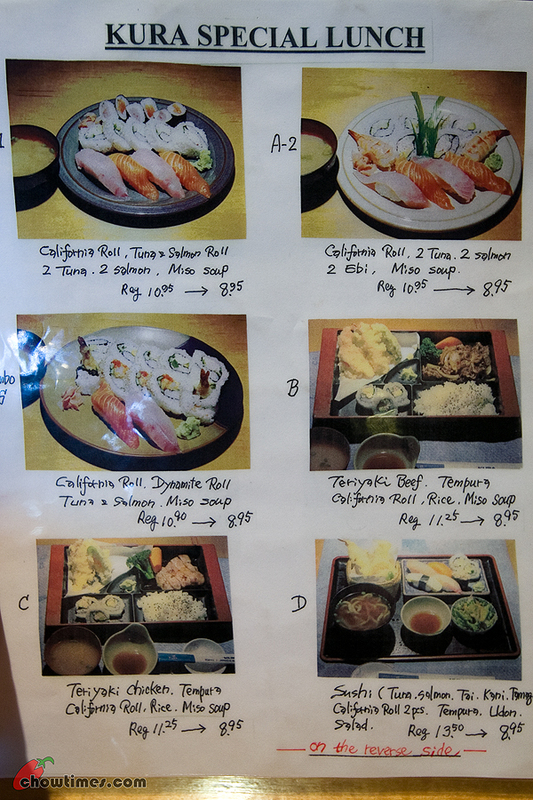 They have a large menu with pictures — making choosing difficult. I wish I could take pictures of their entire menu because I am sure many of you will like to see it. Given the number of pages, I thought I better not or else Karl and I freak them out. So, I just took pictures of their Lunch Special above. What do you think? It’s a buck or two above the normal lunch special price range in many places but they all look a bit more better too. Hmmm … LUNCH SPECIAL. Not sure about you but my benchmark price for lunch specials is $7-$8. Anything above this is expensive and anything below that is real cheap. What about you? 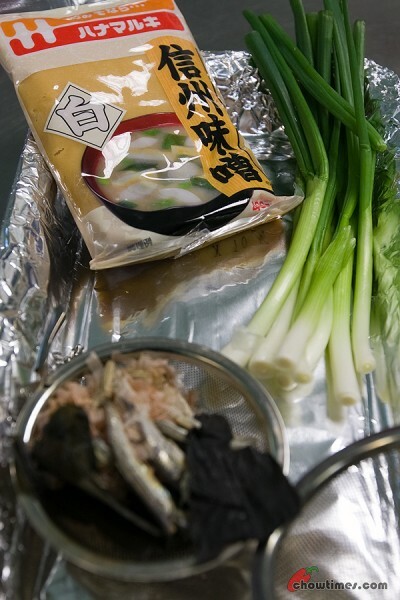 The Miso Soup. We did not order that. I guess it is complimentary for all customers. As far as I know, not many Japanese restaurants serves complimentary miso soup. You know, I can’t get over the idea after all these while that they don’t give a soup spoon with the miso soup. Yeah, I know … the Japanese drinks, no slurp, the soup direct from the bowl. I am saying this because in my research on Chinese cuisine, Chinese do not customary drink direct from the bowl in a formal setting. We decided to get a couple of rolls and two other “fancy” items instead of getting the lunch special. That is just me … I just don’t want to blog about lunch specials because they do not often represent the best the restaurant has to offer. Oh … did I say that just a few days ago? Anyway … we got Beef Sashimi … a small order ($6). I would have preferred a bigger order ($10) but I guess it’s too much to order. 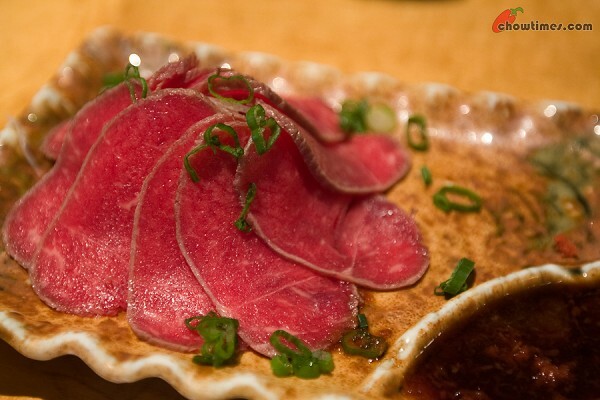 Isn’t the beef sashimi beautiful? 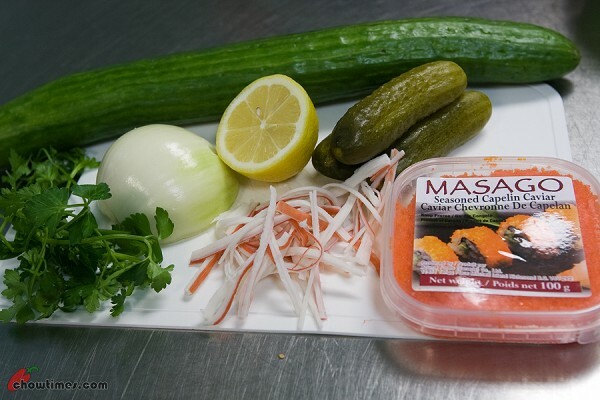 It is simply one of the best looking sashimi I had ever see … and it tasted great and flavourful. When I was eating this, I was thinking if this is safe eating raw beef. LOL! If Suanne is here, she would comment that it is not safe because bacteria will multiply quickly on the surface. So I am curious how they are able to keep this safe. I am sure it is safe … but just wanted to know. Then we got the Geoduck. In Japanese they call this Muragai. Anyone of you know how Geoduck ended up being pronounced as Guu-ey-duck and not G-O-duck? Don’t roll your eyes when I say this OK? Not everyone knows what Geoduck is. For one it is not a duck and does not resemble a duck. This is how Geoduck looks like. A little trivia here … did you know that the Geoduck has the longest lifespan. It is known to easily live up to 150 years! When it came we were kind of delighted, or at least I was. I was thinking … oh wow, all this for just $8?!? Suanne likes desserts. She likes all kinds of desserts. 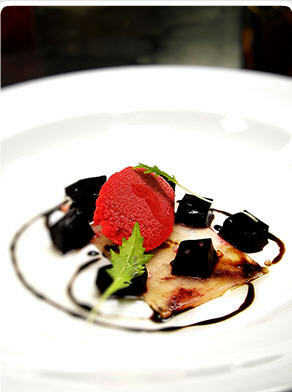 It does not matter if it is cakes or pastries or ice-cream or cookies … even Asian type desserts like red bean soup. It does not take a lot to get her to go out to have dessert. She goes for her dessert fix with Polly every Friday. The problem is she has to go according to Polly’s schedule which is only a couple of hours in at noon. The thing is also most of the better dessert places are opened at night. After the ramen dinner at Benkei, I suggested that we go to True Confections on Denman since we are already around the area. 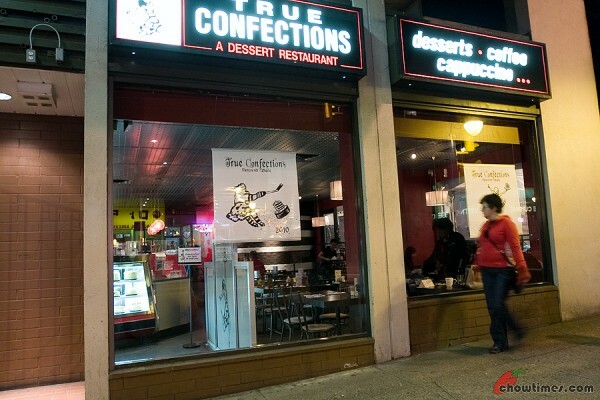 True Confections is one of the places Suanne often says she wanted to eat in. There are three True Confections dessert restaurants in Metro Vancouver. The other two restaurants are on West Broadway and North Vancouver. 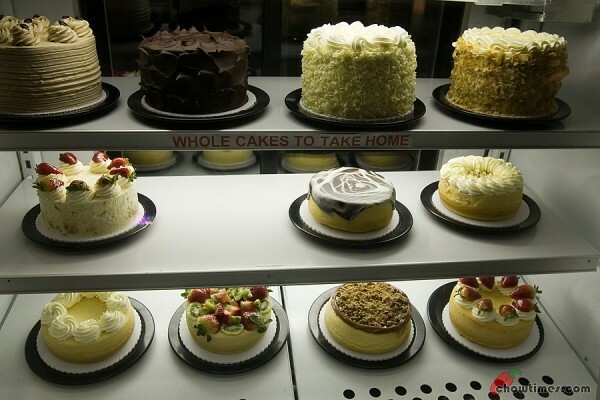 True Confections is known for their cakes which they say is completely made in the restaurant. 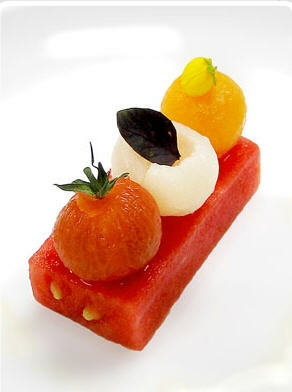 They also made sure that they do not have fillers, preservatives but uses only fresh ingredients. So yeah, they take their cakes very seriously. Specifically, they are known for their very tall cakes. Some of their more popular ones looks like it is 9-10 inches tall. The ones you see above are not the taller ones, but you get the idea. The restaurant was empty on the Friday night we were there. It was the Olympics which drew everyone away to the Olympic zones. We asked the waiter about it and he said it had been very quiet ever since the Olympics started. They had even extended the restaurant in anticipation of more Olympic traffic — but all in vain. I feel for them. If there is anything we could do to help rally people to come to places like this, we would … we should. 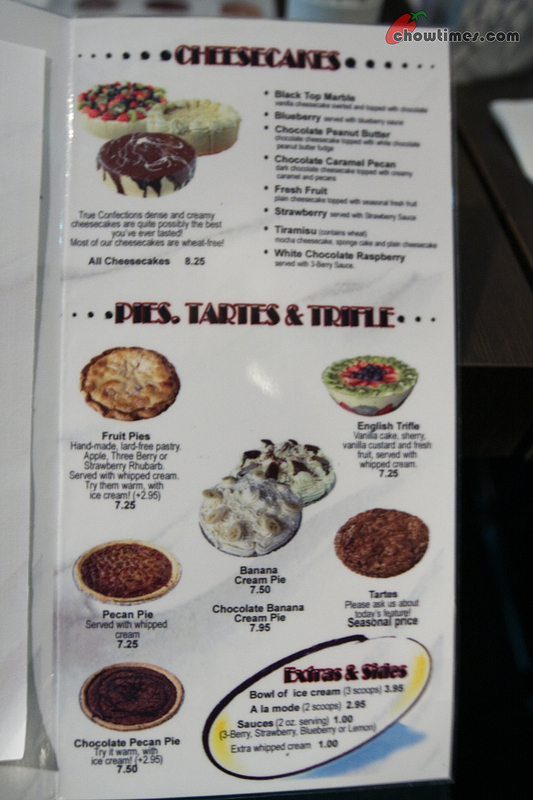 There are cakes, premium chocolate cakes, cheesecakes and stuff like pies and tarts. 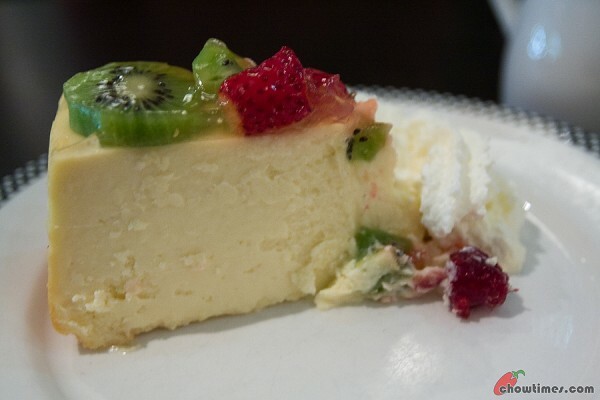 I knew what Suanne wants … cheesecake. 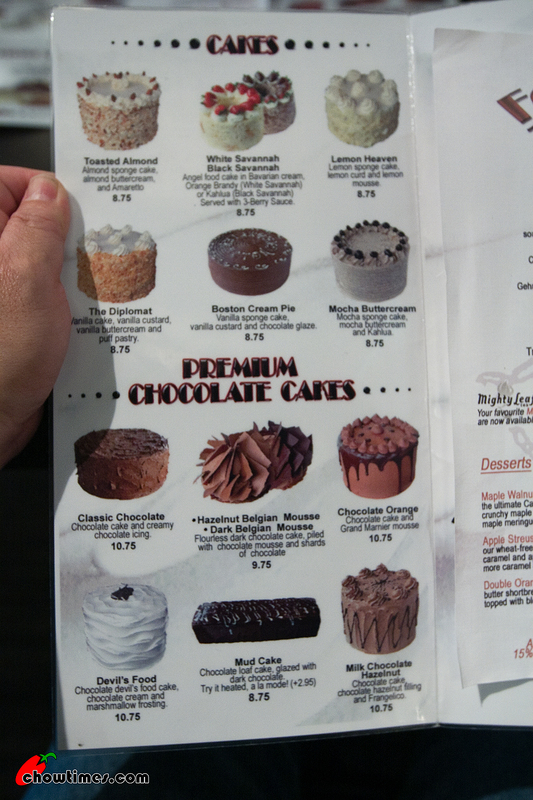 We also cannot ignore their tall PREMIUM chocolates cakes too — they look too good to resist. I don’t think many people see it turning out this way. All the restaurants in Metro Vancouver were all bracing themselves for the expected onslaught of customers during the Vancouver 2010 Olympics. It did not turn out that way. Instead, everyone were clustered around the Robson Square area where the Olympics actions are. Not only that the expected increase of customers did not materialized, the number of customers actually decreased. Suanne and I spent last Friday in downtown. We decided to go to Benkei for ramen. We had always see that this part of the city is teeming with people on Friday evenings. But that day was eerily quiet. Which was good for us anyway. There were no lines when we went there and got a table straight away. 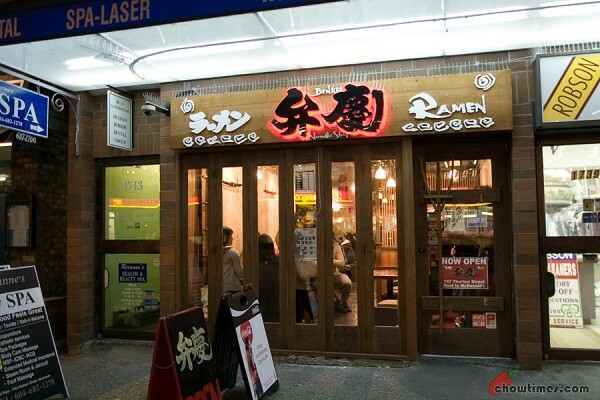 Benkei Ramen had always ran second fiddle to Kintaro Ramen just around the corner. 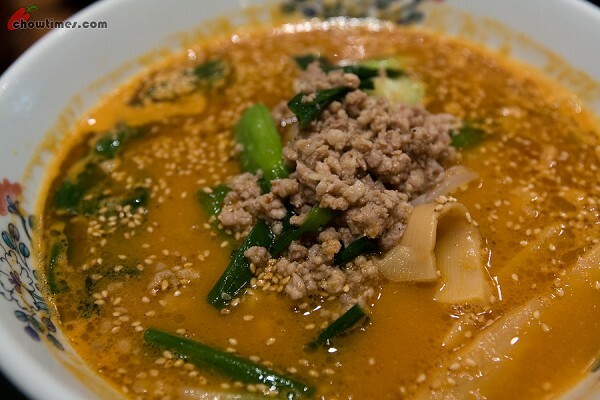 I am not sure why though because I don’t find a lot of difference between the ramens of these two places. Food aside, there are a lot more I like about Benkei than Kintaro. 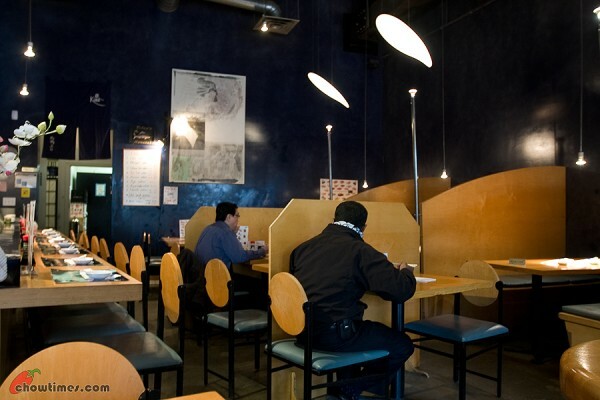 The interior is way better than the bare basic interior of Kintaro. We were kind of surprised how spacious it is inside. From the outside it does look deceptively small and narrow. There is this casualness about Benkei I like too. We thought that the box chairs were a great idea because they also act as a bag holder. We also like the fact that their offer to hang up our jackets. … Suanne and I was just sitting there and was reading a sign on the wall saying that minced raw garlic and chili sauce is available for the asking. The waitress who walked past saw us pointing to the sign, stopped in her track and then said, “I’ll get you some”. The menu is just a simple two-pager. You just order out of the five soup offerings and then decide if you wanted extra toppings and sides to go with it. We got a side order of Chashu Plate ($3.75). Thinking that it would just be a small plate given that price, we were quite pleased it was quite a serving despite it sitting on a bed of beansprouts. 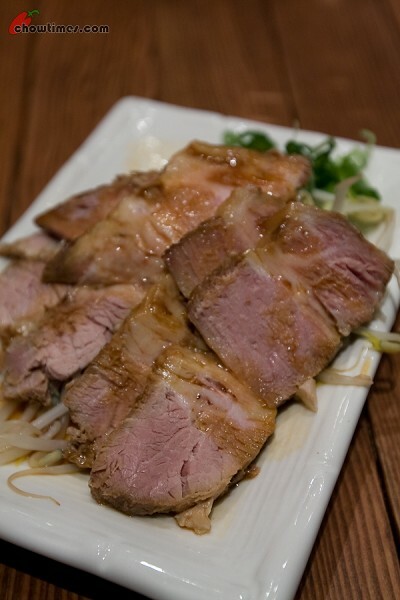 The Japanese name Chashu sounded a lot like Char Siu in Chinese. I am surprised if they have the same root words. We love this. 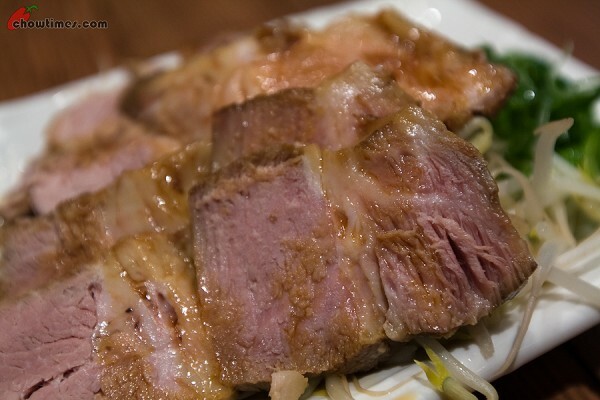 It has a softer and moister texture compared to the Chinese Char Siu with quite a bit of fat too. I had the Akaoni (Spicy Miso) which is $7.80. Once upon a time … almost 10 years ago … when Arkensen and Nanzaro were just toddlers, Pho Hong was the family favourite restaurant. We used to eat there once a week, without fail. Always on a Sunday. That was when we were attending the church nearby. So after service, we always go there for lunch … and always got the same thing. The #1 Special. We were also quite poor then. We rarely spent more than $20 for eating out … a week!! So Pho Hong fits the bill. Pho Hong is cheap. Pho Hong is delicious. Most importantly Pho Hong serves very big bowls of pho. Between the four of us, we just need to order two pho specials and we would find it hard to finish. And all that for just $15. Those were the days when Pho Hong was the #1 restaurant to Suanne and I. Those were the days before chowtimes when it was OK to eat at the same restaurant week after week, ordering the same item over and over again. Those were the good days! It must have been at least 5 years already since we last went to Pho Hong. 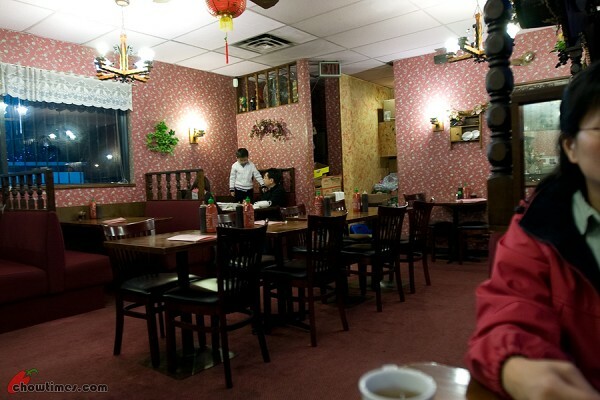 Last week we drove all the way to Kingsway and Imperial in Burnaby for old time sake. The place looked the same as we remembered them … but showing a bit more age … rundown even. The interior still has that ghastly maroon wall paper. The booths at the center of the restaurant is still there. We like those booths which has overhanging plastic vines of grapes. I was told that Pho Hong used to be an Italian restaurant eons ago. 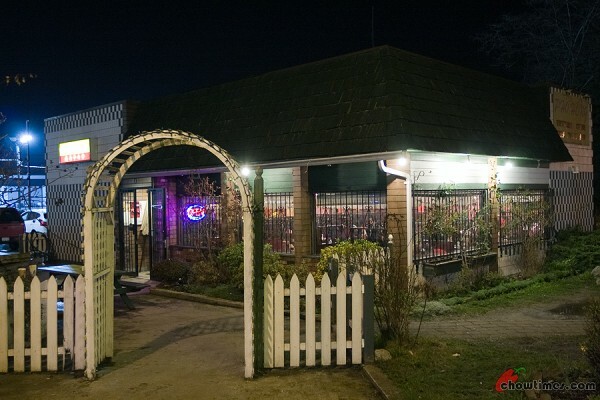 We were such regulars that the owners knew us. That was then. After all these years, we are just another customer to them. They don’t remember us anymore. Arkensen and Nanzaro is no longer the cute toddlers they once knew. 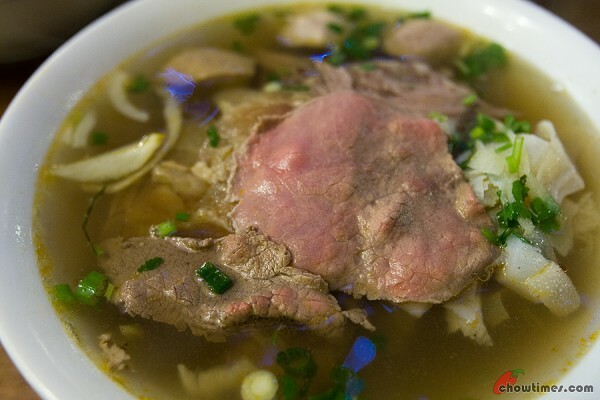 The one great thing about Pho Hong was the smell. 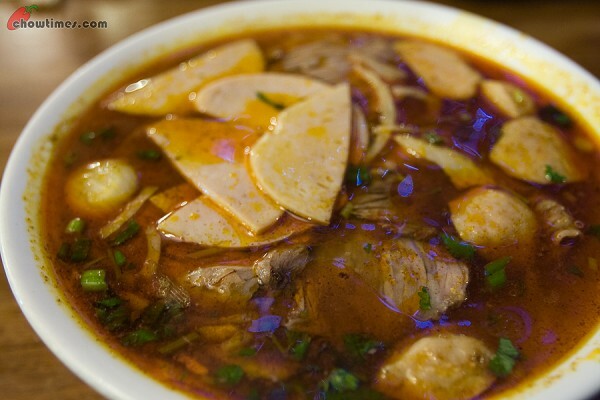 Every time we go there, we end up having our clothes smelling of the beef noodle soup for the entire day. We had never come across another pho restaurant which does that even today. The #1 Special was what we order all the time. It used to be just $7.50 for a big bowl and it even came with a deep fried spring roll. Today it is $8.50. Inflation, I guess. The #1 Special was always MY order and I always shared this with Nanzaro, being the younger one. Nanzaro would hate that I squirt Sriracha chili sauce into the bowl making it all red. I like it that way. So I always separated Nanzaro’s portion into a separate bowl before I do that. This time Arkensen said he wants the #1 and it goes without saying that he is not going to share this with anyone anymore. The #1 Special tasted just as good as it was back then. They serve the beef pinkish raw but with the soup close to a boil, it needed just second to cook the meat. The soup was flavourful but we felt the bowls were smaller … or maybe our appetite are now bigger. I am not sure. 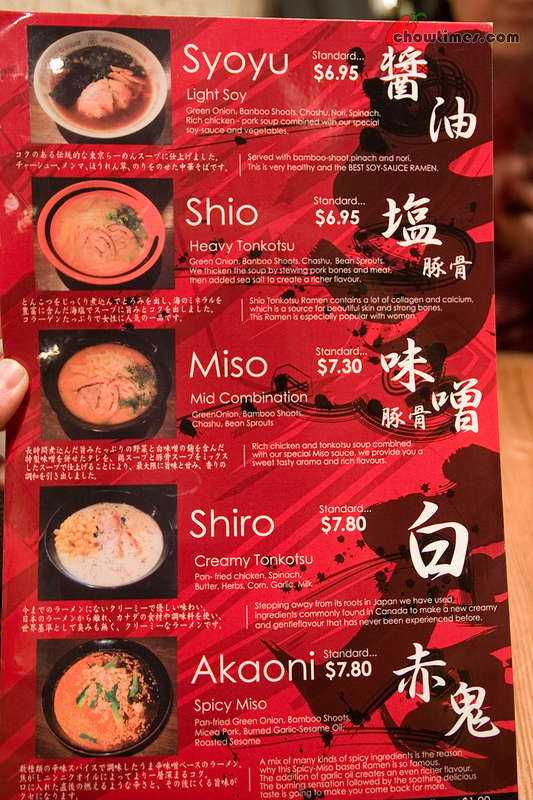 The reason why we ordered the #1 was because it had everything … beef slices, beef ball, tendon & tripe. The spring roll which came with the “special” was good. It was served hot like they had just made it to order. 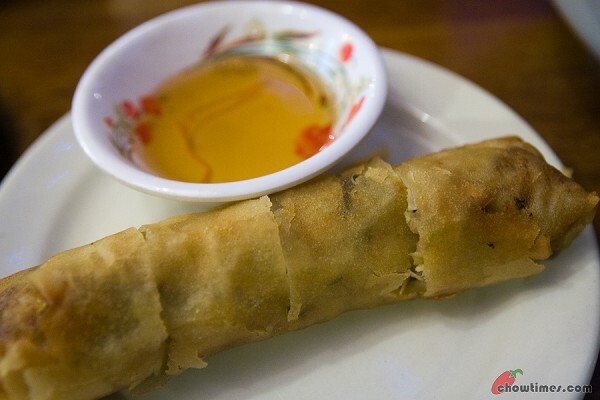 We prefer the coarse kind of wrapper … I think the rice paper kind. But no complains because we like this too. 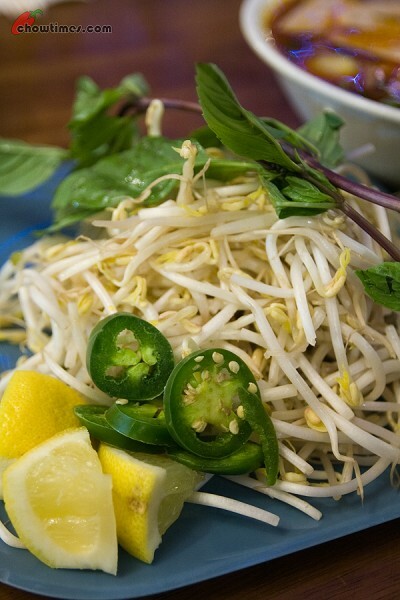 The bean sprouts were OK — just OK. We had super fresh ones before. I ordered salted plum with Soda ($2.95). 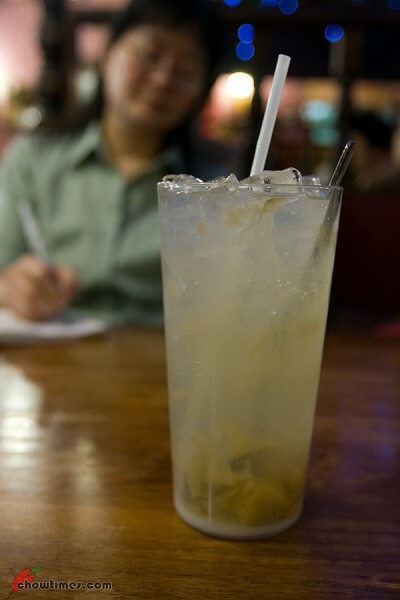 I like this because it is a very good thirst quencher and the glass was bigger than normal. I had never thought of this until now … Suanne does not order drinks at all. She does not like flavoured drinks; opting for water or tea if she can help it. The thing is our boys did not order drinks too. They always asked for iced water and I did not think much about it. So when I was sitting here writing this blog post, I asked them why. Gosh … now I know why but am not at liberty to tell you the reason. This because you-know-who said she will knock my head if I tell anyone. LOL! You ask you-kn0w-who if you want to know. For a person who used to stop me from squirting Sriracha Chili sauce into the pho, Nanzaro had graduated to eating spicy food. 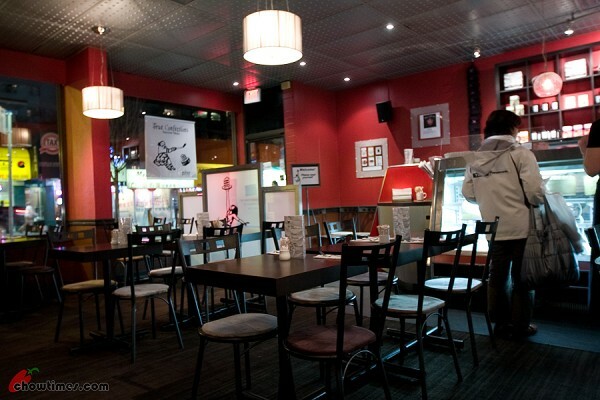 Zen Fine Chinese Cuisine Opened — Want To Join Suanne and I for Dinner? Updated: 17th Nov 2014; This restaurant is closed. 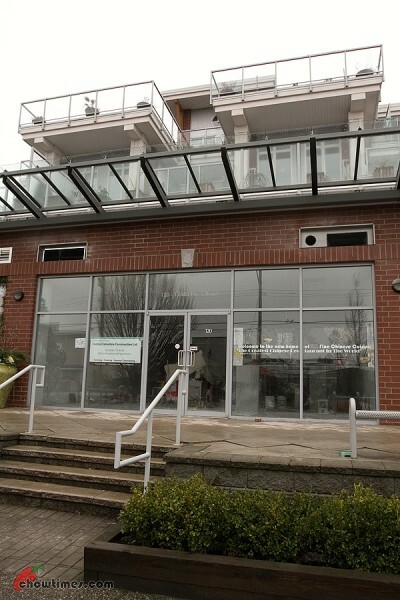 In December last year, we came across a shop lot in Steveston that with sign saying that Zen will be re-opening. Well, Sam Lau’s Zen Fine Chinese Cuisine restaurant had re-opened last week. Suanne and I had just booked for dinner on Friday, February 26th. 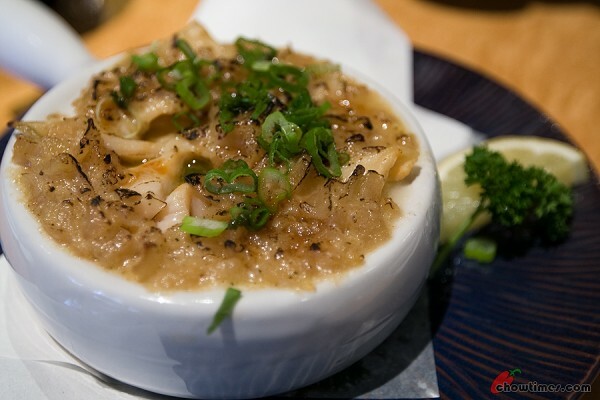 We were wondering if an chowtimes readers would like to join us in checking out Sam Lau’s re-incarnation of his famed “Greatest Chinese Restaurant in the World”. Zen became famous overnight in 2008 when Jennifer8 Lee of the New York Times wrote a book called The Fortune Cookie Chronicles in which she traveled around the world checking out Chinese restaurants. 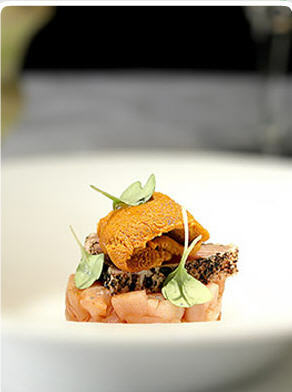 In her book, she heralded Sam Lau’s Zen Fine Chinese Cuisine as “the world’s greatest Chinese restaurant outside China”. Whether Zen is really the world’s greatest Chinese restaurant outside of China is open to debate, I know. There is a question too as to why Sam had to close Zen even after getting a second wind from Jennifer 8’s review in her book. Anyway, we wrote about the publicity Zen had from Jennifer8 Lee’s review and our tasting at Zen shortly after. Recently, we wrote to Hakkasan about Zen and we had a very in-depth response from Hakkasan which we will share on a later blog post. Suanne and I was thinking that perhaps if we could get like 2 to 4 couples to join us, it would be great. We have a reservation for 5:30PM. For hockey fan, please note that the 2nd Semi-final of the Men’s Hockey game is on at 6:30PM. Please send me an email at ben@chowtimes.com if you are interested in joining Suanne and I. 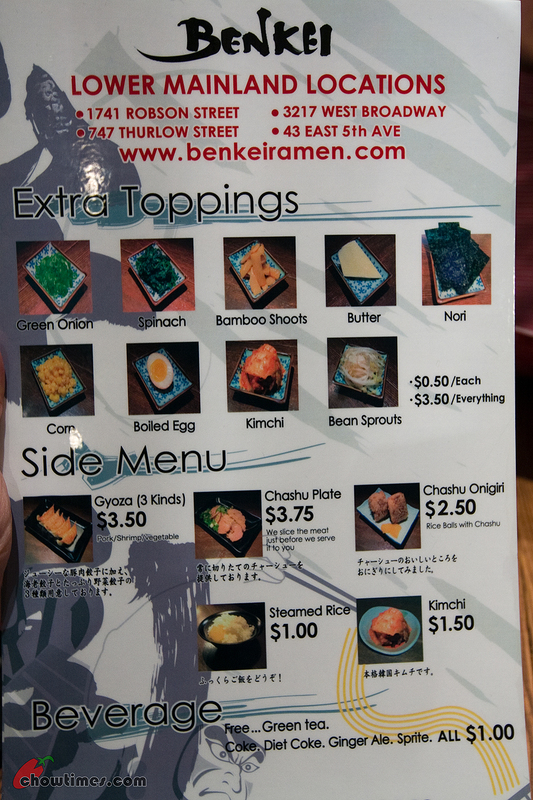 The menu are as follows … we are looking at trying the Menu B. 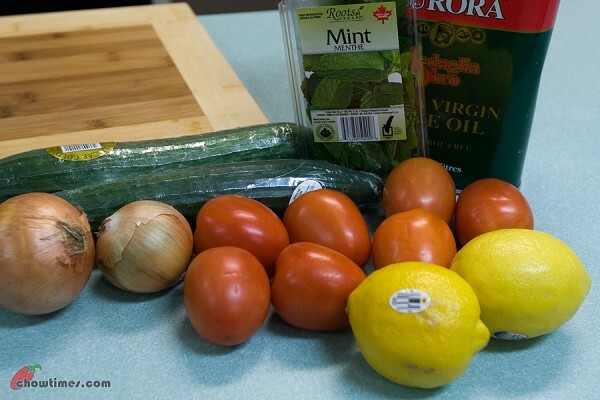 Since we have some time left, Minoo added a salad recipe in the South Arm Community Kitchen. The salad is called Salad Shirazi and is named after a city in Persia. Shiraz is located in the southwest of Iran. Shiraz is known as the city of poets, wine and flowers. 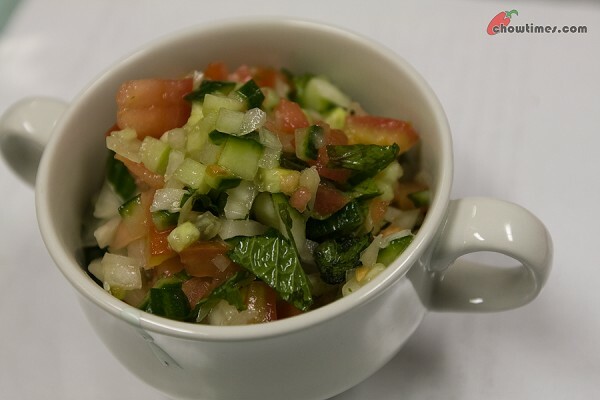 Salad Shirazi is a salad without lettuce.